Like New York city, Haywards Heath could be described as somewhat of a shopper's paradise. Unlike New York city, the streets of Haywards Heath are not overrun with bums, hoods and punks. 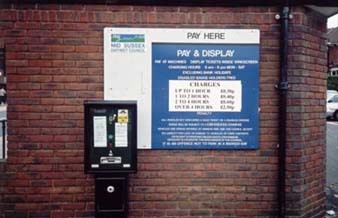 Shopping is made easy with the 5 pay and display car parks located around the main shopping arena. Exact money in Pounds Sterling is required. The Orchards is the only semi-covered shopping arena in town. It used to be home to the Hiltons department store but it closed probably due to high rates or something. We used to have a Benetton but that closed too. The Orchards is home to Marks & Spencers, Superdrug, that shop with the coloured glassware in the window and lots of other 80's style items, the post office and a family butchers. You can also get your keys cut and heels repaired while-u-wait. The Orchards is well protected against "ram raiding". The Orchards has ladies boutiques and a branch of the Next chain of stores. There are many other shops to meet the needs of even the most discerning or experienced shopper. Menswear specialists A.H. Broadbirdge (AKA Man Shop) have supplied the town's men with leisure, formal and school ware for over forty years. Profits have soared since the closure of Kinch and Lack. They also have a branch in nearby Burgess Hill, but our branch is nicer. Haywards Heath also has a branch of the 'Officer's Club' providing stiff price competition. However, the 'Officer's Club' do not sell Farrah slacks giving Broadbridges a real 'ace in the hole'. That is until you bring 'Michael Brown' (location: Orchards) into the equation. It's like a jungle out there it makes us wonder how they keep form going under. Haywards Heath had only two jewelers when we first started writing this guide to the town. This was surprising given the high average disposable income of many of the town's residents. However, as Haywards Heath booms we now have four jewelers, 2 at the economic end of the market, a standard one that does carriage clocks and a fancy contemporary one. 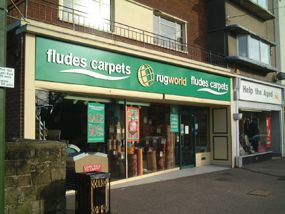 Carpet and floor covering specialists Fludes (incorporating Rug World) has for many years occupied the premier position in the towns floor covering market place. Having revamped its carpet showroom a few years ago Fludes cemented its reputation as a supplier of quality Axminster and other deep and short pile coverings. However, Fludes was dealt a fierce blow late in 2005 by carpet giant Allied Carpets when Allied bosses chose the remaining empty double unit in the Choices development at the foot of South Road as the location of its new premier south east showroom. We remain convinced that given its extensive experience in meeting the specialised flooring needs of Haywards Heath residents, Fludes can withstand the onslaught from one of the country's biggest players. The son of comic genius Norman Wisdom owns a sports shop in Haywards Heath. Its called Wisdom Sports and not so recently moved to larger premises to accommodate a wider clothing range. Man Utd tops are very popular. As are Bjon Borg style head bands. The dedicated ladies Wisdom Sports closed due to a marked downturn in demand for 'Dash' pastel towelette gym wear. 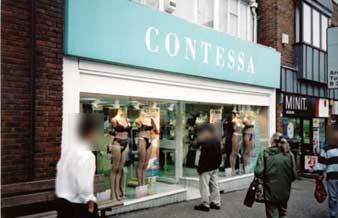 Contessa is Haywards Heath's most popular racy lingerie boutique. Their provocative window displays give a tantalising glimpse into the private world of the Heath lady's boudoir. They also probably sell garments suitable for the lady with bladder problems .Unlike Ann Summers, Contessa do not sell marital aids the size of your forearm. As a nation of animal lovers I'm sure you will want to visit Pets Corner. Friendly staff might help you purchase or maintain a pet that is right for you. Please note they stock a wide range of manure and doggie treats. Haywards Heath has a dedicated printer cartridge shop called Cartridge World. Competition between Cartridge World and classic office supplies store, The Business Shop, has been fierce leading at one point to a provocative advertising campaign on local radio station Bright 106.4 (more music, more variety). Betamax may have been the superior technology but that didn't stop the might of VHS from dominating the video tape market in the 1980s. It also killed off Video 2000 but that's a different story. Like Betamax, Mr Video was small but well specified and, sadly, like Betamax Mr Video in the end had to concede defeat in the battle against the market power of pre-recorded entertainment giants, Choices and Blockbuster. Located in between haberdashers, Baldwins and a wine merchants, formerly Peter Dominic, Mr Video was a pioneer of the visual home entertainments revolution. For instance, Mr Video had a 24 hour unattended title return slot years before it became common place in the video rental industry. The Mr Video shop unit is now occupied by 'Tropical Antiquities', a new age brick-a-brack retailer of some sorts. Families wishing to have some professional photographs taken for display in their garden room or main entertainments room had for years needed to go no further than South Road and the opulent studio of some photography experts whose names we cannot recall. The studio has now closed leaving a gaping hole in the family and family dog portraiture market. As evidenced by this recent photograph, the unit has now been occupied by a dry ice showroom. 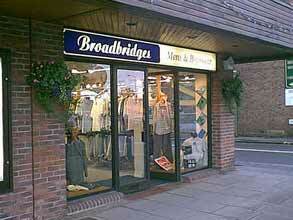 For up to the minute gentleman's fashions there's no better place than Broadbridges on Sussex road.